Inga was born in 1902 on a farmstead in Elizabeth Township. She was the youngest, and the last survivor, of eight children of Oscar and Kari (Jensen) Johnson. After completing grade school in Elizabeth, Inga went on to Park Region College in Fergus Falls and Dakota Business College in Fargo. Early in her work life, Inga was employed as a cashier and stenographer at DeLendrecie's Department Store in Fargo, and at the First National Banks in Mayville and McIntosh. While she was employed as a cook at Two Medicine Chalet in Glacier National Park, Inga began to enjoy photographing the scenery and hiking in the mountains. Her travels took her as far as the Pacific Ocean, and while in California, she learned that her brother Charles had purchased the Lake Alice Grocery in Fergus Falls. Inga soon joined him in the neighborhood grocery business. She worked for 50 years at the store – into her 80's – and some ten years after her brother had died. Inga also was active in her church – singing in the choir, teaching Sunday School and working with the church women's organizations. She continued her love for climbing mountains and tending flowers. With her interest in photography, Inga was a charter member of Heart O'Lakes Camera Club. During the Second World War, she was a member of the Red Cross Blood Mobile Canteen. As Inga began to reach 90 years of age – and having been in and out of nursing homes several times – she knew it was time to begin planning her estate. With legal counsel, Inga established a living trust to manage her assets and contain her estate plan. She provided management of her assets for the years she expected to be in a nursing home. Inga planned to make appropriate gifts to relatives (nine nieces and nephews), local friends and associates, and charities – as the success of her investments permitted. Inga also decided to establish a permanent endowment fund to provide benefits, in perpetuity, for people living in and around the Fergus Falls area. The plan considers her investments, insurance, trusts and annuities. For many years, Inga had contributed to a number of charitable nonprofit organizations in the Fergus Falls area. It was her wish to continue this support even after her death. A Living Trust and Endowment Fund with West Central Initiative (WCI) were the means Inga chose to accomplish her goals. Inga Johnson. One of life's true gifts. 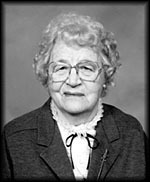 Giving of herself and her financial resources: that's how Inga lived her life and that is how she is remembered today: Making life better for future generations in Fergus Falls and for the entire region.